Open Access and ORO – not just about mandates! Baillie, Lesley (2017). An exploration of the 6Cs as a set of values for nursing practice. British Journal of Nursing, 26(10) pp. 558–563. This paper has been downloaded over 7,000 times by users from over 90 countries and territories since deposit in June 2017. When institutional repositories are indexed by Google and Google Scholar they are great platforms to make papers discoverable and accessible on a global scale. 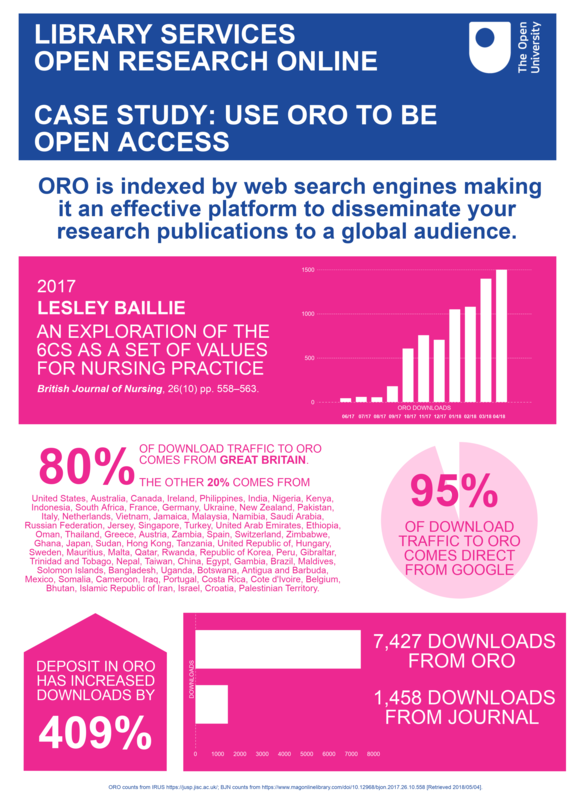 Deposit in an institutional repository like ORO can be massively beneficial in the dissemination of research papers of the community it serves. Chris looks after Open Research Online (ORO) on a day to day basis. He has worked in this role since 2011 and can advise on using ORO to maximise dissemination of research outputs and Open Access publishing generally. This entry was posted in Library research support, Open Access, ORO. Bookmark the permalink.